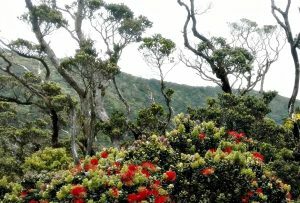 ROD has affected more than 135,000 acres of ʻōhiʻa forests on Hawai‘i Island since it was identified more than four years ago. PC: Big Island Now. 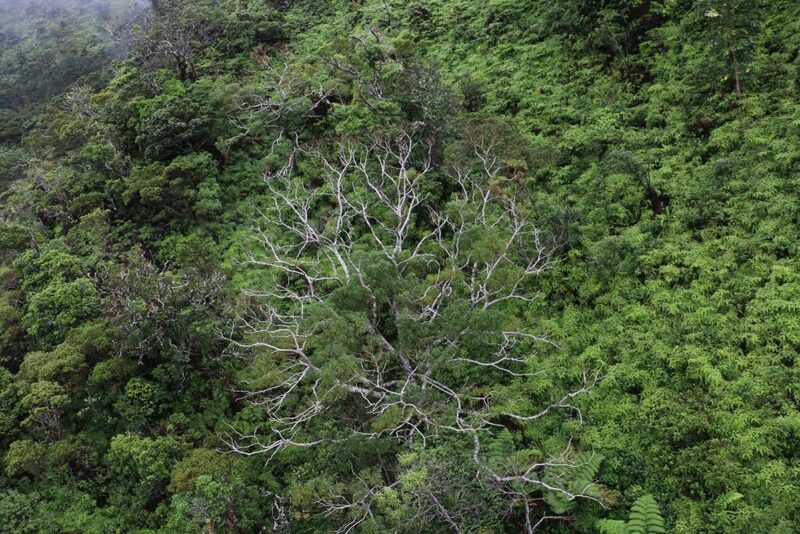 Five ʻōhiʻa trees on Kaua‘i have been discovered dead as a result of Rapid ʻŌhiʻa Death (ROD) fungus. 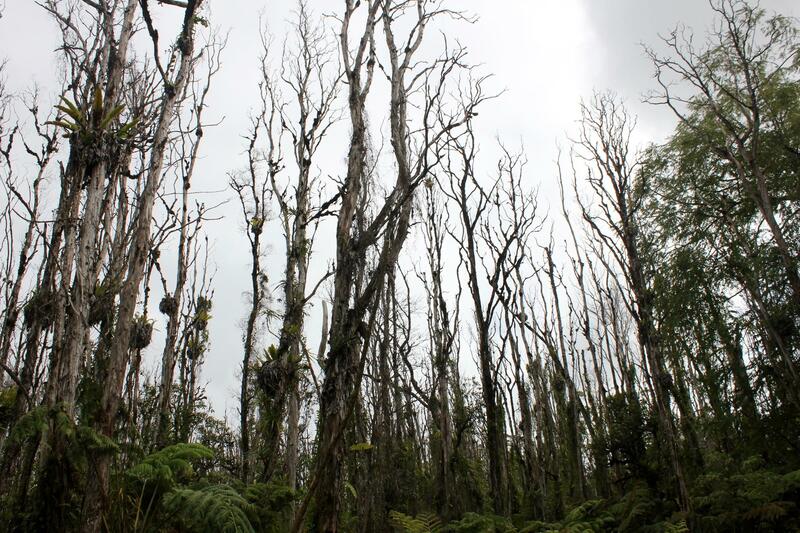 Kaua‘i DLNR Division of Forestry and Wildlife (DOFAW) botanist Adam Williams discovered the trees last week in the Moloa‘a Forest Reserve and lab results confirmed the presence of the fungus known as Ceratocystis huliohia (formerly called Ceratocystis “species B”). 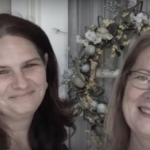 In response, a team of experts from state and federal agencies and nonprofit organizations gathered to investigate the tree deaths using drone and helicopter flight surveys and lab tests. On Wednesday, May 9, team members from the DLNR/DOFAW, Dr. Keith’s USDA lab, the University of Hawai’i’s College of Tropical Agriculture and Human Resources, the Kaua‘i Invasive Species Committee (KISC) and The Nature Conservancy (TNC) hiked into the forest reserve to examine the two trees confirmed to be infected. 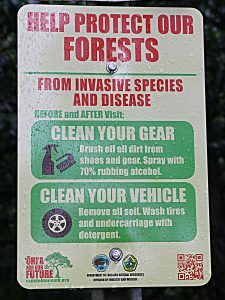 Rob Hauff, state protection forester for DLNR/DOFAW emphasized several protocols to prevent the spread of ROD including scrubbing boots and other footwear with 70 percent isopropyl alcohol after forest visits and thoroughly washing any equipment and vehicles that enter forested areas. 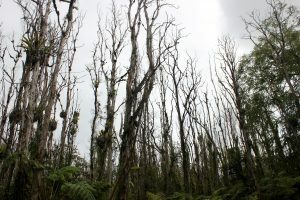 More than 135,000 acres of ʻōhiʻa forests on Hawai‘i Island have been affected by ROD since it was identified more than four years ago. 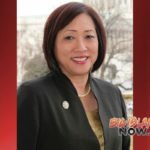 The extent of the current infection on Kaua‘i is unknown, and there is no indication that it spread directly from Hawai‘i Island, according to researchers.